We have reached Week 14 of the fantasy football season, and it’s time to look at rankings changers. In most leagues, Week 14 means it’s playoff time! With the margin for error as thin as it has been at any point of this season, getting a jump on the competition could be the difference between winning and losing. As each week goes by, we have new information that is presented to us and it requires careful consideration. You don’t have much time to reflect before you must turn the page to the following week of action. 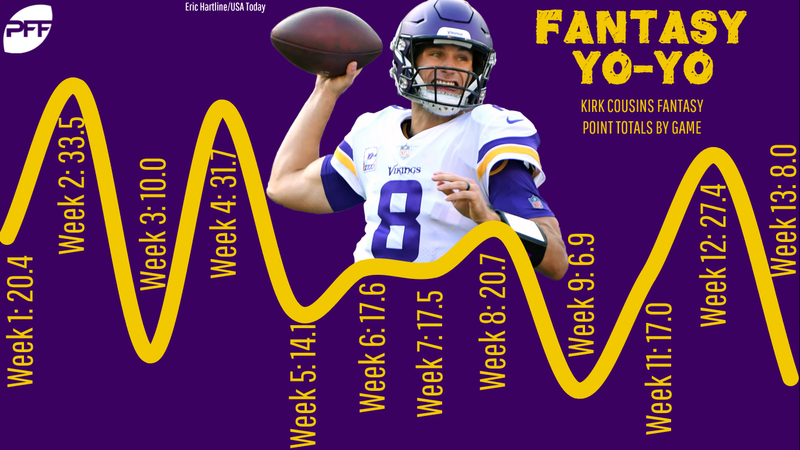 The first step in that transition is assessing which players are on the rise and which ones are falling in the fantasy rankings coming out of the weekend. It wasn’t quite the effort he put in last time out in the fantasy bonanza versus the Rams, but Mahomes did post his fourth-best effort of the year as he passed for 295 yards and four TDs and rushed for 53 more yards vs. the Raiders. … Allen continues to show fantasy promise under center for Buffalo. He had his best game to date in Week 13 rushing for 135 yards on nine carries while passing for 231 yards and two scores. The rookie has now finished as a top-eight fantasy QB in two straight weeks. … For the first time since Week 4, Carr exceeded 280 passing yards and he hit the three-TD mark for just the third time all season in the loss to the Chiefs. Lindsay delivered the best fantasy output of his young career as he exploded in Cincinnati for 157 yards and two touchdowns on 19 carries. 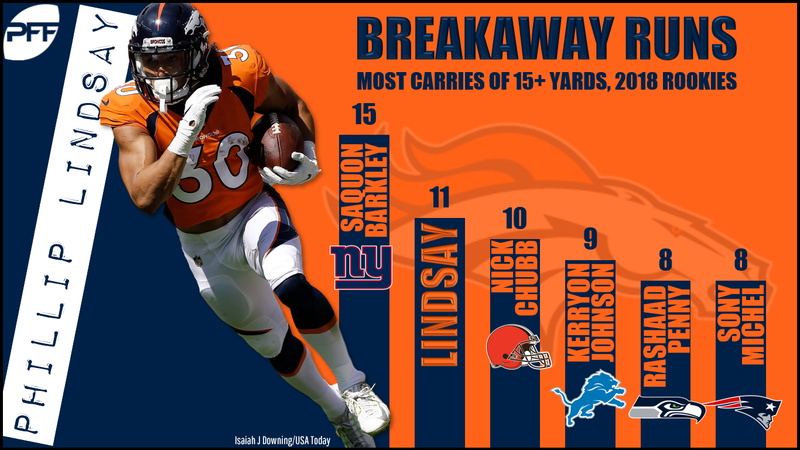 Denver has won three straight games and Lindsay is a huge reason why as he is averaging 7.9 yards per carry and has scored five times during that span. … One of the most clutch performers from Week 13 was undoubtedly Cohen, who did a little bit of everything the Bears’ loss to the Giants. Not only did he tally 186 total yards of offense and catch 12 balls, Cohen also sent the game to overtime with a 1-yard TD pass to Anthony Miller. … With the sudden release of Kareem Hunt, the Chiefs turned to Ware in a pinch vs. the Raiders. He saw 14 carries in the contest and finished with 47 yards and a TD. Ware is the favorite to lead the team in carries the rest of the way and should offer RB2 value. However, look for Kansas City to work several other running backs in the mix down the stretch. We were reminded once again in Week 13 of how high a ceiling Allen provides, especially in PPR leagues. He reeled 14 of his season-best 19 targets for 148 yards and a touchdown in the come-from-behind upset of the Steelers. … With DeSean Jackson (thumb) inactive, both Godwin and Humphries shined for the Bucs as they knocked off the Panthers. Each of them finished Week 13 as top-10 fantasy receivers. … Pettis once again came up big with Marquise Goodwin and Pierre Garcon out of action. The rookie netted 21.5 yards per target and finished with 129 yards and a stellar 83.3% catch rate. Over the last two games he has registered nine receptions for 206 yards and three touchdowns on 13 targets. … Callaway posted a decent stat line (3/84/0), but the day could’ve been so much better. He had a 76-yard TD catch called back due to an offensive holding penalty. Two plays later fumbled on 71-yard reception as he was going into the end zone again. More big plays are coming for the rookie. With Hunt out of the picture and Sammy Watkins sidelined, Kelce was the center of attention in the Chiefs’ offense as he caught 12 of his team-high 12 targets for 168 yards and two scores. The tight end now has 22 receptions for 295 yards and three touchdowns over his last two. … Ebron saw a season-high 15 targets and caught 10 of them for 81 yards at Jacksonville. With Jack Doyle out for the season, expect Ebron to put up top-level production. … Hooper continued to make his case to be considered a starting fantasy option at tight end by pulling in all five of his targets for 44 yards and a score. It marked the fifth time in 12 games he reached double-digit PRP points. Cousins followed up one his best efforts of the season last week against Green Bay with a fantasy stinker in Week 13 at New England. He only averaged 4.6 yards per attempt and mustered just 201 yards and a touchdown while being picked off twice. … The Ravens locked down Ryan on Sunday, leading to one of his worst performances of the season. He finished with only 131 yards passing on 16-of-26 passing with one touchdown and two interceptions. … For the second time in three starts in relief of the injured Sam Darnold, McCown failed to surpass 135 passing yards or throw a touchdown. He’s also had four interceptions during that span. Darnold is trending toward a Week 14 return, which should put an end to McCown’s misery. It was a brutal day all around for the Falcons’ offense against the Ravens, and Coleman was no exception. He only gained eight yards on six carries. The running back has been in a rut of late, averaging just 3.5 yards per carry over his last four games. … Lewis continued to disappoint his owners in Week 13 as he had just eight touches for 34 total yards vs. the Jets. He’s seen his role decrease steadily in recent weeks and last scored in Week 9. … Michel saw his fantasy value take a double hit this past week as the Patriots welcomed back Rex Burkhead (17 snaps/7 carries/2 targets) and called fullback’s James Develin’s number twice at goal line in their win over the Vikings. … Ingram continued to struggle for opportunities in the Saints’ offense and netted a season-low 27 rushing yards in Week 13. He’s a boom-or-bust, TD-dependent RB2 for the stretch run. … With Leonard Fournette set to return from his one-game suspension for Jacksonville, Hyde can once again be dropped for more appealing options. 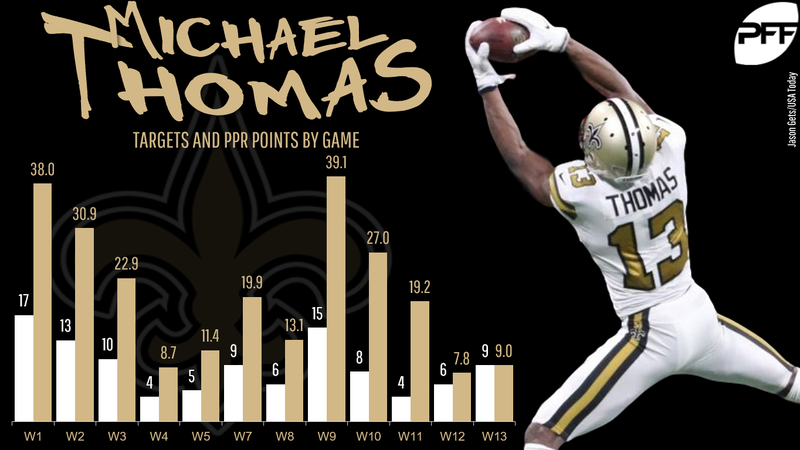 For the second straight week, Thomas failed to get 40 yards receiving or score a touchdown. During that span he has totaled 78 receiving yards and nine catches on 14 targets. He has only netted 5.57 yards per target over the stretch compared to his season mark of 10.51 yards per target. … Evans disappointed in Week 13 after back-to-back outings with 100-plus yards receiving. He was held to four catches for 44 yards and without a touchdown for the fourth time over his last five contests. … It is pretty clear that Diggs is playing at less than 100%. He reportedly had his knee swell up overnight Saturday leading up to Sunday’s game at New England. Diggs was active and finished with a 5/49/0 stat line while playing on 47 of the Vikings’ 61 offensive snaps. … After being inactive on Thanksgiving, Smith returned in Thursday’s loss at Dallas. Despite playing 44 snaps Smith was only targeted one time and went without a catch. He offers big-play ability, but as the rookie has shown his floor is rock bottom. The inconsistent play continued for Njoku in Houston as he finished with just three catches for eight yards. He’s now had 18 or fewer yards in three of his last five contests, making him tough to trust in the fantasy playoffs. … Everett appeared to be on the rise after his two-TD performance against the Chiefs, but he followed that up with a one-catch day in Week 13 at Detroit. He’s now had one catch or fewer in seven of 12 games this season. … Owners who turned to LaCosse hoping he’d pick right up where Jeff Heuerman left off before his season-ending injury were left disappointed. The Bronco failed to pull in his only target against the Bengals after he scored and netted 34 yards a week earlier.